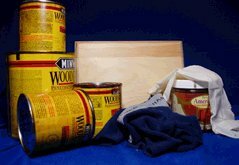 Wood staining tips for the decorative painter. 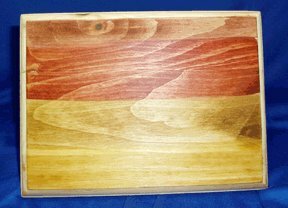 For the decorative painter, wood staining can add a lot of depth and richness to a project. It enhances the wood grain and brings out its natural beauty. By painting your design on top of the stained wood, your work goes from great to Zow-Wee!!! When it comes to staining wood, there are many stain colors and manufacturers to choose from. But stains come in only two basic types; oil-based and water-based. At the top of the pine sampler, featured here on the left, is a water-based stain in Mahogany. Oil stains offer the richest colors. They are easy to apply, take about 24 to 48 hours to dry but require some special precautions. You'll need rubber gloves to protect your hands. And it's important to work in a well-ventilated area, away from any open flames. Clean up requires mineral spirits, if necessary. Water-based stains are generally quick to dry and relatively easy to apply. You will not get the same richness from water-based stains as you will from oil-based ones. The colors are a bit flatter in overall appearance. But on the plus side, clean up is soap and water. This stain is friendlier to use for those who suffer from asthma. This is probably one of the best wood staining tips! If the wood is porous, like pine, consider doing this minor step before starting your staining. First apply a wood conditioner (not a sealer) to help prevent patchy areas. The conditioner, once dry, allows the stain to be absorbed evenly. No nasty surprises! 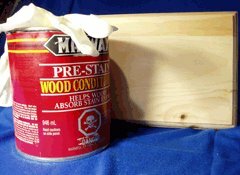 When you're applying the wood stain or conditioner, just follow the instructions on the product label. Our personal preference for applying stains is with a soft rag... hubby's knickers come in handy! Dip the rag into the stain and apply it following the direction of the grain. If you can't get at the seams or joints with the rag, try a small, round brush touched down where the wood pieces meet. Once the stain has had a chance to absorb for a few minutes, use a clean rag to wipe off the excess. A cautionary note... A rag soaked in oil stain can become combustible (spontaneous combustion) under the right conditions. So, we recommend you place the rag outside to air dry or putting it in a water-filled glass jar with a tight-fitting lid. Please dispose of it according to your city by-laws. As for rags used from water-based stains, it's fine to toss them in the garbage. To protect your newly wood stained background before painting, it's helpful to lightly mist your piece with Krylon Matte Spray. Feel free to contact us here if you have any questions or you have interesting tips you'd like to share. We love getting your e-mails! Let's leave Wood Staining and go to Wood Finishes.